The Corometrics 250cx Series provides comprehensive perinatal monitoring and the flexibility and convenience that give you instant access to the detailed information you need during labor and delivery. Having that information readily available helps you provide a positive birthing experience for mother and baby. 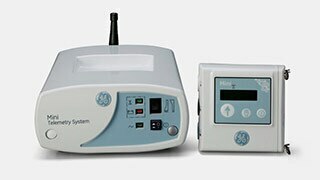 GE-exclusive Smart BP* delays blood pressure measurement during contractions to reduce patient distraction and provide more meaningful diagnostic data. ChartLight with backlit keys and a dimmable display helps you work comfortably while your patients remain relaxed in a low-light environment. Our watertight transducers have 9-crystal ultrasound technology that allows for easier pick-up and less repositioning, even for difficult to monitor patients. The 9-crystal design achieves a wider focal region for more uniform coverage at greater depths than traditional 7-crystals. Since a majority of your monitor interactions can be done using our one-touch hot keys, you’ll spend less time with the monitor and more time with patients. 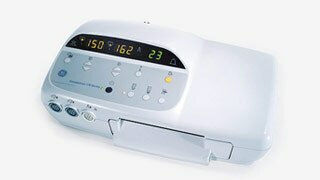 DINAMAP* SuperSTAT* non-invasive blood pressure technology speeds up determinations by as much as 66% after the first reading to enhance patient comfort and allow you faster access to patient data. Integrated Exergen Temporal Arterial Thermometer allows you to obtain maternal temperature using non-invasive infrared technology. Readings automatically print on the fetal strip. The monitor provides a choice of integrated Masimo® SET or Nellcor® maternal pulse oximetry, making it easy for you to monitor, document, and even view the waveform. Selectable 3 Lead maternal ECG provides clinicians with QRS wave amplitude and meaningful diagnostic data. Centricity* Perinatal (CPN) compatibility, which streamlines the capture and archiving of patient data and helps speed workflow and ensure data availability. Telemetry Interface allows for continuous monitoring without changing transducers during ambulation or laboring in water.